You know it's properly spring weather when I've got my denim jacket out again! 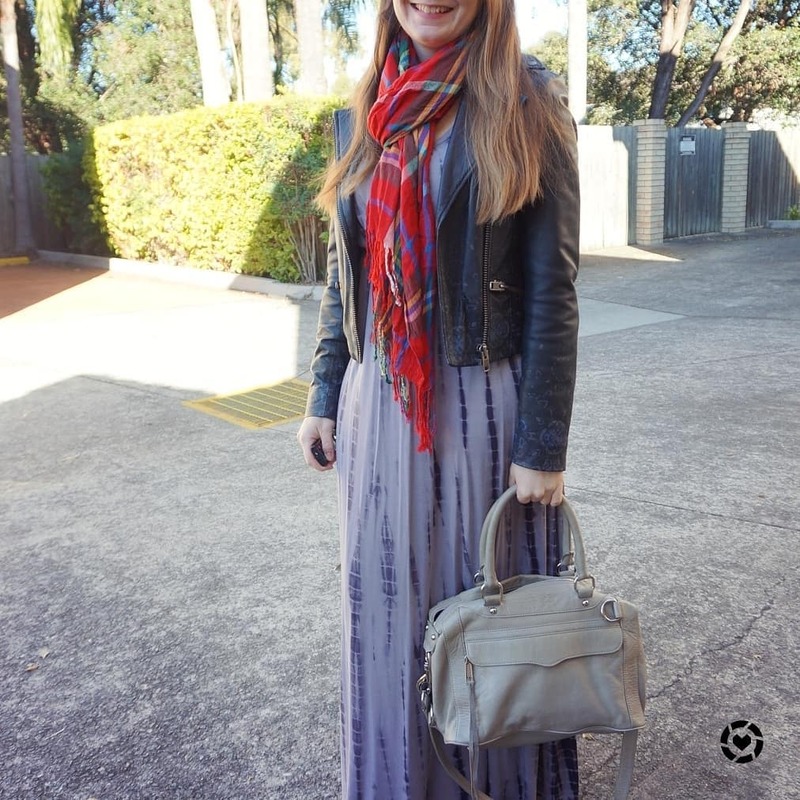 I took advantage of the nicer warmer weather recently to wear some of my maxi dresses with my ankle boots and light jackets. 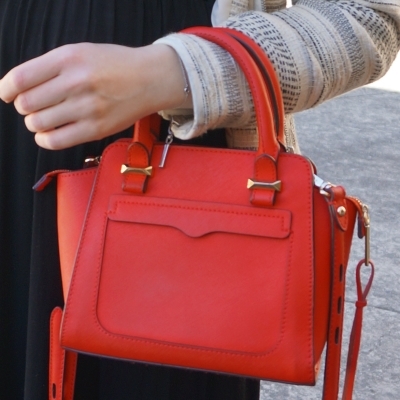 I completed both outfits with a pop up of colour from the red Rebecca Minkoff micro Avery tote bag. We decided to take the boys to a nearby strawberry farm (Chambers Flats) after seeing some of the other Aussie Vlogging Mums having fun there. Edit: This was before the big strawberry tampering crimewave across Australia, I'd have second thoughts about letting the boys touch unwashed and unchopped strawberries now! Support your local farmer but take precautions as advised by the police - wash and cut up before giving to children. The ankle boots were a great choice as the ground was uneven and muddy in parts, but as you can see my denim jacket didn't stay on long, it was a beautifully warm and sunny day. After filling our boxes with strawberries we sat by the playground and had a picnic. 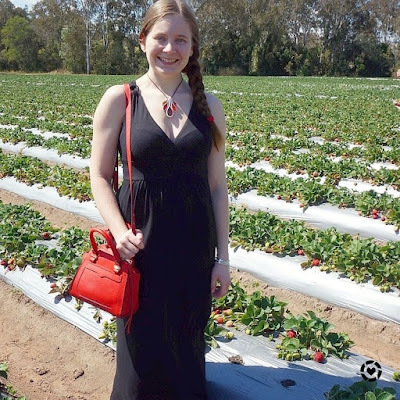 Was such a nice way to spend the day, and fun for the boys to see where strawberries came from. We had so many we ended up turning some of them into a delicious smoothie later. 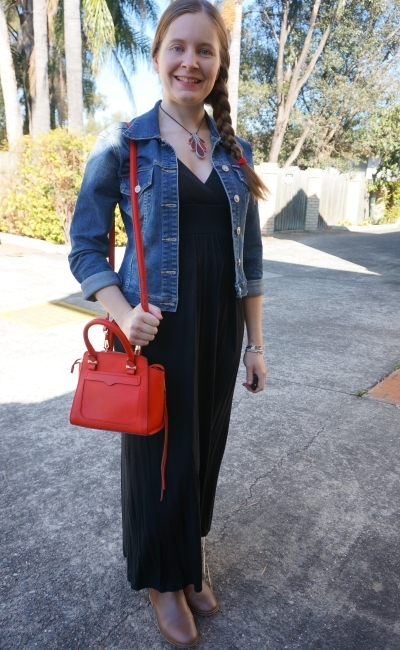 Last worn: denim jacket, black halterneck maxi dress, black ankle boots. 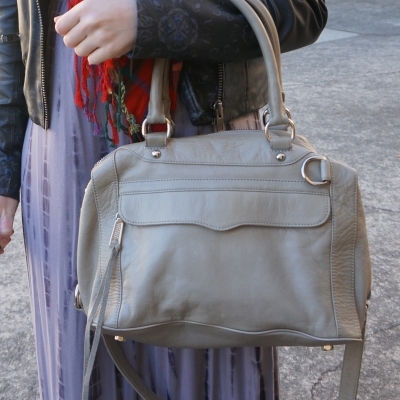 First time I've worn the avery bag on the blog as it's a recent purchase. Other ways to wear: denim jacket and shorts, black halterneck maxi dress and kimono, black ankle boots worn 30 ways, Rebecca Minkoff micro Avery bag and jeans. Perfect for pregnancy: denim jacket in second trimester, black halterneck maxi dress in third trimester, black ankle boots in second trimester. 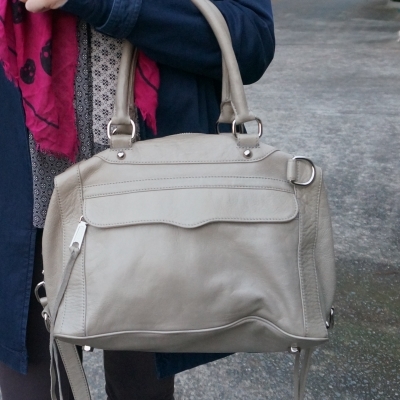 In case you missed it, I shared the reveal of this bag as part of my shopping haul video on YouTube, including how I managed to score this bag so cheaply, making it the cheapest leather handbag I've owned! Another black maxi dress with this little red Rebecca Minkoff avery bag. It's just such a fun pop of colour against the black. Again I went with ankle boots under my dress as I wasn't sure what the rules were for our first activity of the day - the Steve Irwin Sea Shepherd ship was in the docks at Brisbane and they were providing tours. We took the boys along so they could explore the ship, it was a lot of fun and something a bit different for them! As I shared on instagram, it can be a little tricky taking pics with the boys in tow. The photo above captures the struggle well, and why I try to get photos before I even leave the house, ha! After going out for lunch and some naps for the boys, it was off down the coast for Father's Day dinner with my parents. I thought my pretty embellished black maxi dress was perfect for dinner, but worried that it may have been a little overdressed for the ship tour. I swapped out the jacket and wore a denim jacket during the day to try dress it down a little. 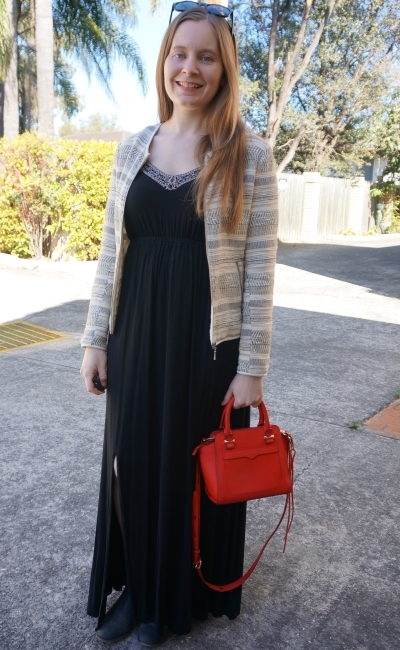 Last worn: jacquard jacket, black embellished maxi dress, black ankle boots, Rebecca Minkoff micro Avery bag (above). Other ways to wear: jacquard jacket and skinny jeans, black embellished maxi dress and kimono, black ankle boots and printed shorts, Rebecca Minkoff micro Avery bag and logo tee. Perfect for pregnancy: jacquard jacket in third trimester, black embellished maxi dress at 39 weeks pregnant, black ankle boots in second trimester. A little black dress is a wardrobe staple. A black maxi dress in particular is a great option for a mum as you don't have to worry about it being too short, no matter what your day holds. It also goes effortlessly from day to evening, a maxi dress is so easy to dress up or down. 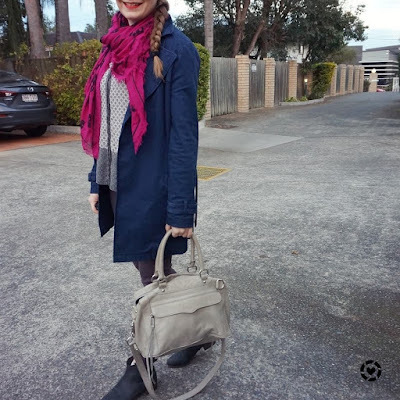 Linking up with Oh Hey Girl, Fabulous Friday, Weekend Wear, Friday Faves, Weekend Linkup, Flashback Fashion, Lizzie in Lace. Wearing a few of my recent purchases to the office! I managed to pick up a couple of long sleeved tops at the opshop sale last month. While it was nearing the end of winter in Brisbane and getting warmer, it's still quite chilly when I have my commute to work so I knew the long sleeves would be perfect to wear to the office. I'm lucky my dress code is on the casual side of business casual too so a tee is perfectly acceptable, especially when paired with a pencil skirt as I have here. Keeping things simple, I stuck with monochrome outfits and added a pop of colour with my scarves, topping off my outfits with the fun tassel statement earrings I also bought last month. Keeping things really simple and going completely monochrome with the black long sleeve tee and black pencil skirt. I usually plan my outfits the night before, and figured the print on the top would stop the outfit looking too boring. When I put it all on in the morning though, I realised the print on the top wasn't doing enough to add a bit of lightness, especially paired with the black pencil skirt, black tights and ankle boots. Even the navy earrings weren't lifting this enough, it looked a bit drab. 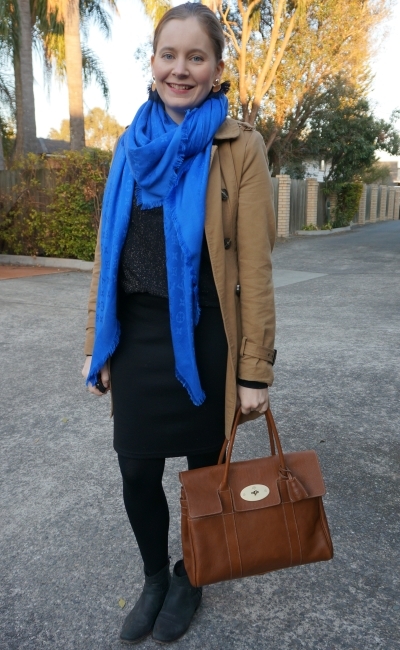 The bright blue Louis Vuitton shawl was the perfect solution - a great pop of colour against the black. It also kept me nice and cosy in the morning. I like that spring like weather is arriving again here in Brisbane, but it's still extremely wintery in the early hours! 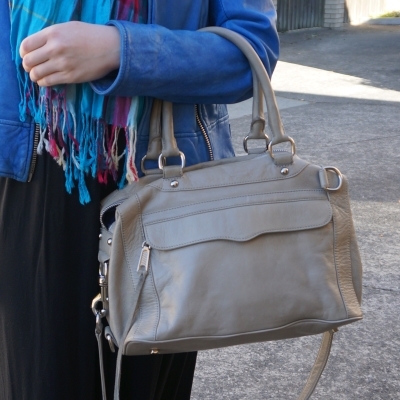 Last worn: camel trench, Louis Vuitton shawl, black pencil skirt, black ankle boots, Mulberry Bayswater tote bag. It's the first time I've worn the tee on the blog as it's a recent purchase. Other ways to wear: camel trench and sheath dress, Louis Vuitton shawl and floral dress, black pencil skirt in autumn, black ankle boots worn 30 ways, Mulberry Bayswater tote bag in summer. 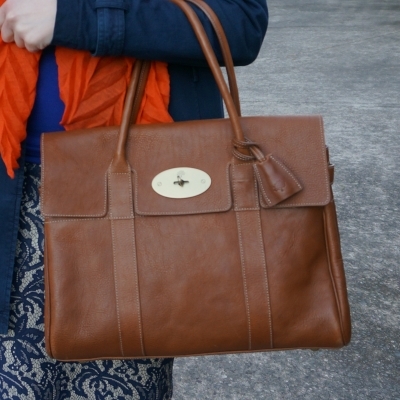 Perfect for pregnancy: camel trench in first trimester, black pencil skirt in first trimester, black ankle boots in second trimester, Mulberry Bayswater tote bag in third trimester. Still a monochrome outfit, but sticking with my favourite colour and going blue with the cobalt tee and the lace pencil skirt. 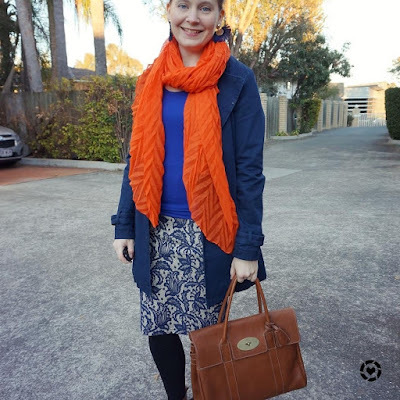 I added even more colour to this with the orange scarf, it really pops against blue and I've worn it that way before with a navy dress. I love how well the navy earrings coordinated with the blues on my outfit and they got a few compliments! I've admired the statement tassel earring trend on the ladies I follow on Instagram for a while, but with particularly curious and grabby toddlers I was sure it was going to be a trend I'd have to let pass me by. Suddenly realised I could do what I do with all other non-kid friendly pieces in my wardrobe and just wear them to work. Even if I do have to take them off as soon as I get home in the afternoon! They were fun to wear and try out for something different from my usual accessories! While I loved the blue and orange together I really wasn't happy with the ankle boots I chose for this. I am noticing every time I wear these tan boots with black tights it just emphasises how petite I am and makes my legs look a bit stumpy. The longer length pencil skirt doesn't really help! 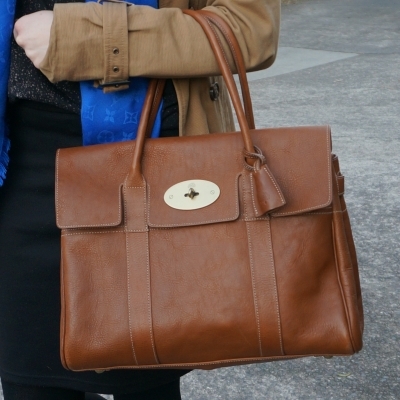 I thought that with the oak Mulberry Bayswater bag it would tie in nicely, but a few times through the day I wished I'd worn my black ankle boots instead. 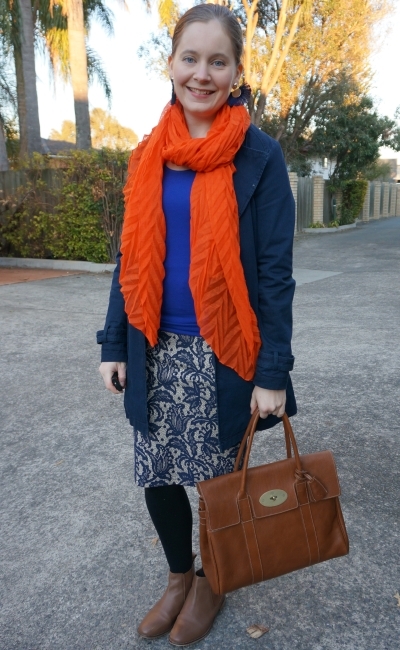 Last worn: navy macintosh, orange crinkle scarf, blue lace pencil skirt, Chelsea leather boots, Mulberry Bayswater (above). First time I've worn the tee on the blog as it's a recent purchase. Other ways to wear: navy macintosh and wrap dress, orange crinkle scarf and shift dress, blue lace pencil skirt and blazer, Chelsea leather boots and maxi skirt, Mulberry Bayswater and chambray dress. Perfect for pregnancy: blue lace pencil skirt in third trimester, Chelsea leather boots in second trimester, Mulberry Bayswater in second trimester. 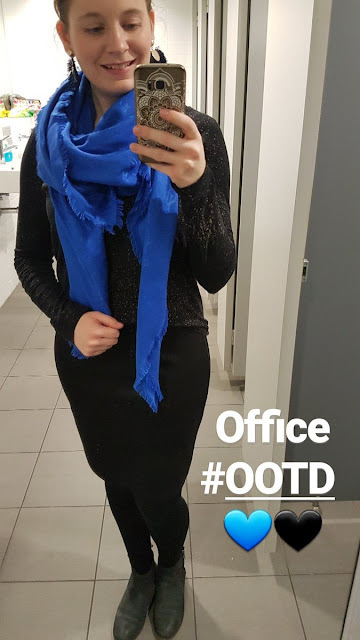 A monochrome office outfit makes getting dressed for work easy - even if you haven't planned out your outfit the night before! 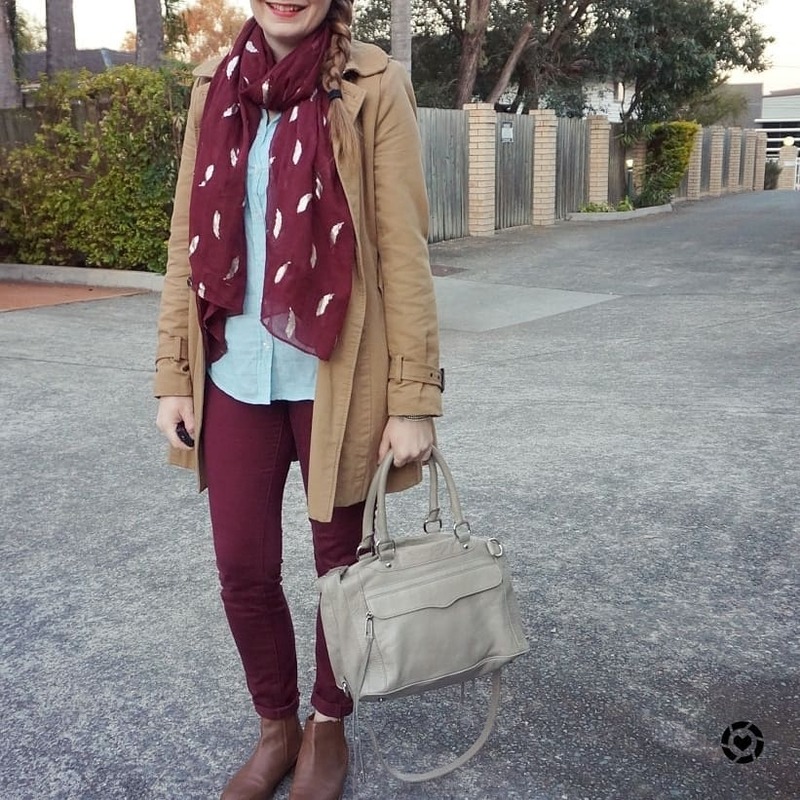 For an extra touch, you can add a bright contrasting scarf on top. It makes a simple monochrome outfit seem more interesting, keeps you warm on a cold commute and it's a fun way to accessorise. Talking about Mater nappies today, and sharing some dress outfits I wore recently. 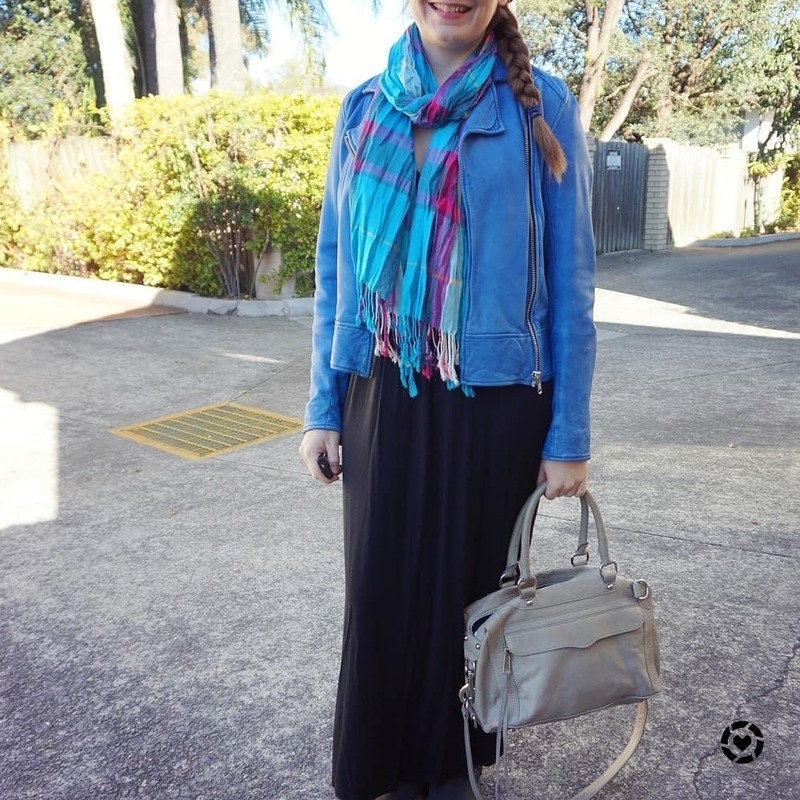 Because sometimes it's nice to break out of the stay at home mum default outfit of jeans and pull on a pretty dress! 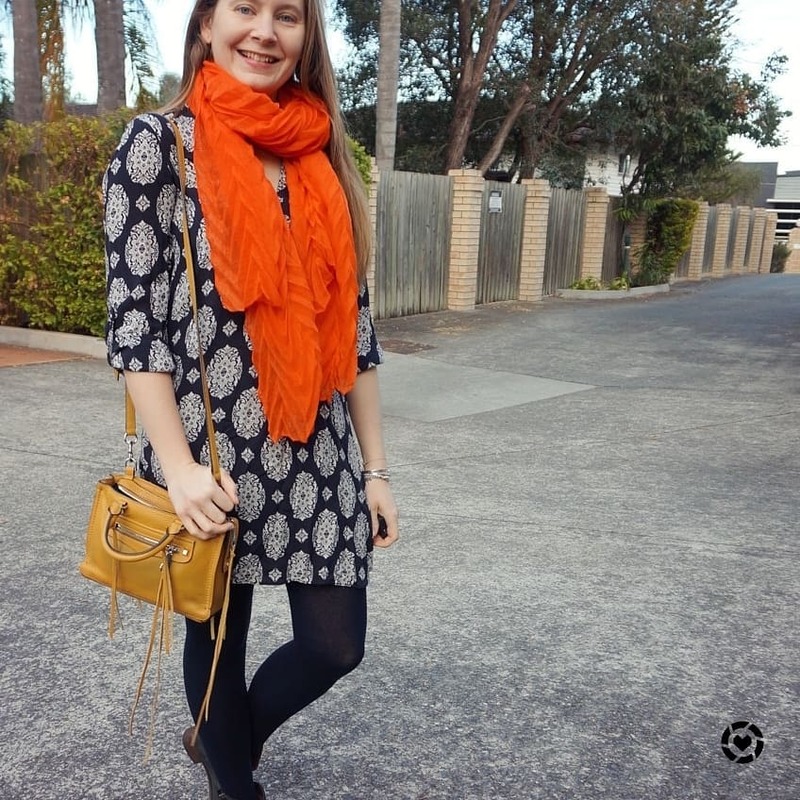 Bright scarves make accessorising a printed dress really fun. 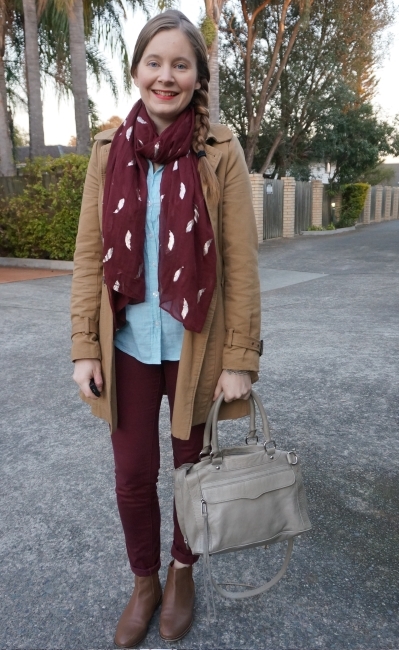 As a bright and colourful scarf is bold enough on it's own, I try to wear it with a nice neutral outfit. 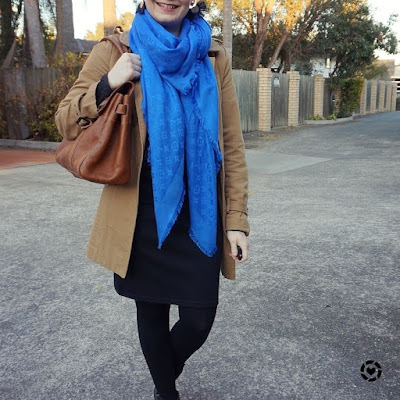 In both of the outfits below I've layered up a navy printed dress with tights, ankle boots, and then a bold pop of colour with a scarf and my mustard Rebecca Minkoff micro Regan bag. 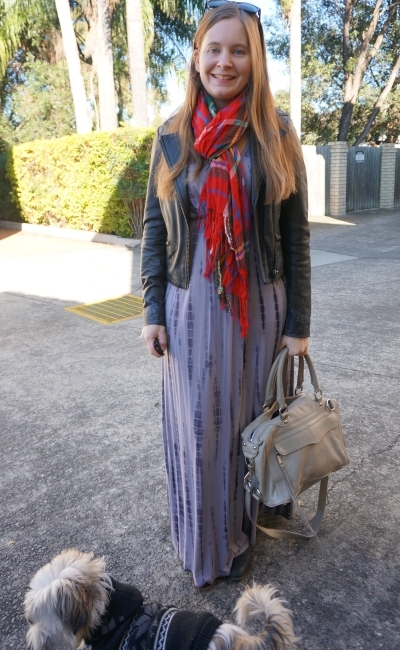 This is what I wore to go to the closing down sale of my favourite opshop. There was a big 'fill a bag for $2' sale which I was lucky enough to wrangle the morning browsing at while hubby stayed home with the kids. 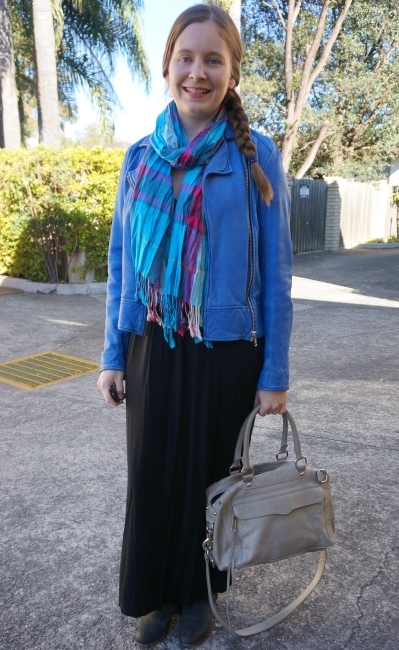 It was supposed to be a warm day, but it was a cold early morning start for me so I wanted a nice cosy scarf to add to my outfit. I thought this one was perfect, the orange really pops with the navy and the little mustard micro Regan bag was another touch of colour that worked so well with the dress. Had a fun morning browsing, filling two bags full of things for the boys and I. You can see what we got here. After I headed to Kmart, picked up a pair of shoes I'd been lusting over, and was back home in time for swim lessons. We ended up going out for lunch after, so I was glad I dressed up a little in this dress. Although I was grateful for the tights underneath, this dress can seem a little short when you're constantly bending down to toddler level! 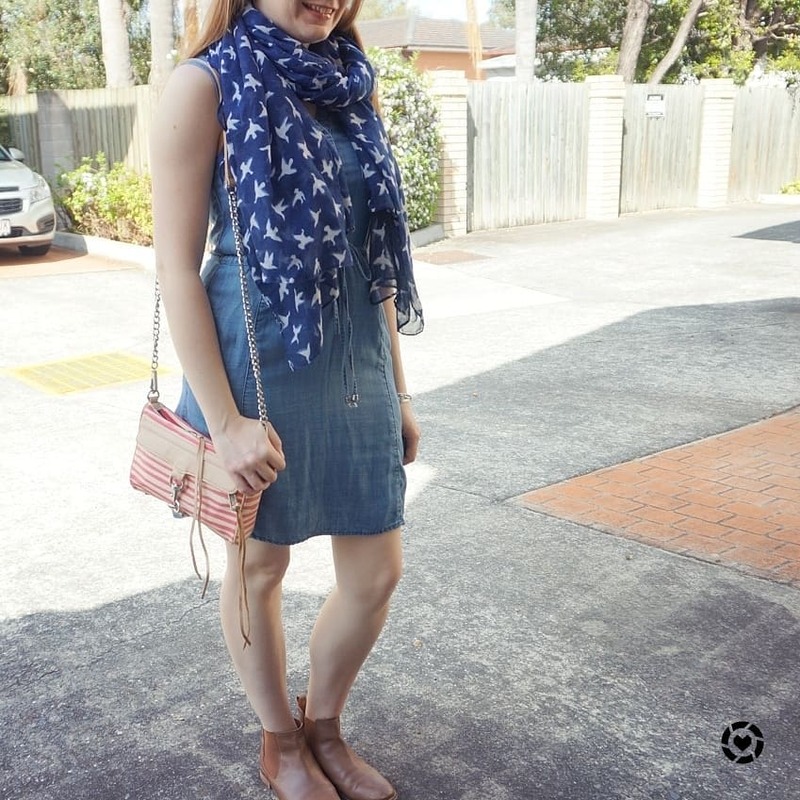 Last worn: Zara navy printed dress, black ankle boots, Rebecca Minkoff micro Regan bag. 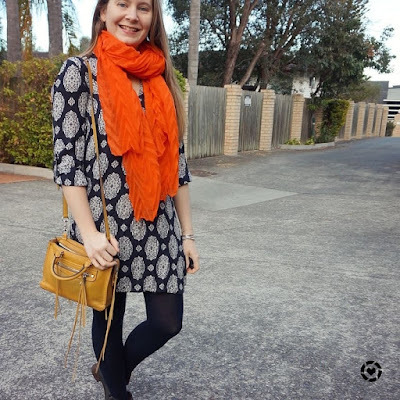 First time I've worn the orange crinkle scarf on the blog as it's a recent addition to my wardrobe. Other ways to wear: Zara navy printed dress in summer, black ankle boots and maxi skirt, Rebecca Minkoff micro Regan bag and skinny jeans. Perfect for pregnancy: Zara navy printed dress in third trimester, black ankle boots in second trimester. 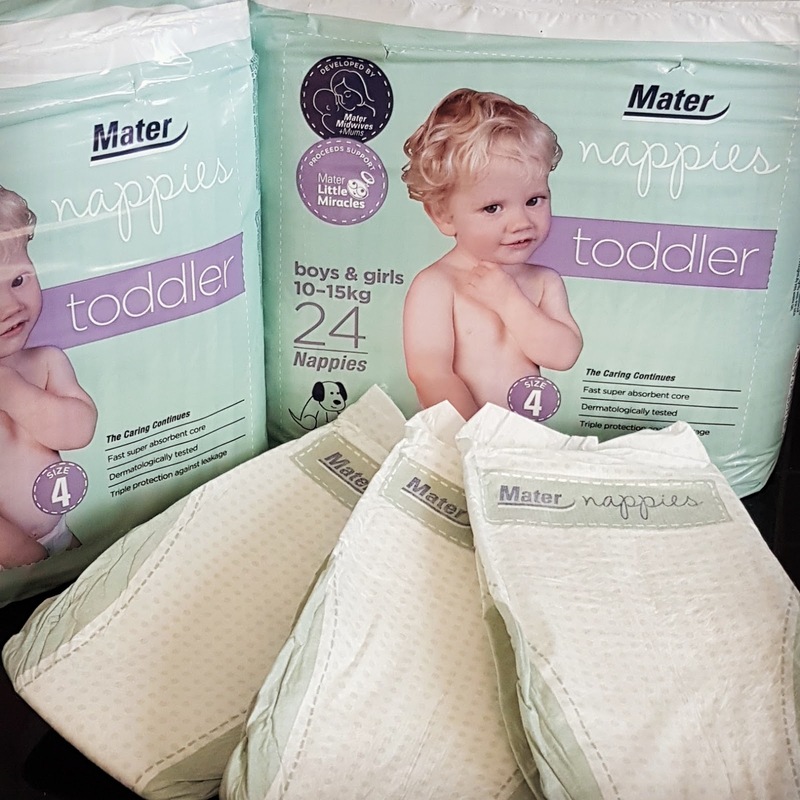 Full disclosure - I received these nappies to try from Mater for the purposes of reviewing them, after chatting with the brand at the Blogger's Brunch a few weeks ago. I've also used these nappies before when my little one was a baby. Nappies developed by Mater Mother's Hospitals! They are part of Australia's first product range developed by a hospital. Welcoming over 10,000 babies a year into the Mater Mother's Hospitals around Australia, they know babies well! The nappies are made from ultra-soft breathable material, dermatologically tested and proven not to cause skin irritation. The toddler nappies have double leg cuffs and provide triple protection against leaks, as well as a super-absorbent core. As mentioned above, I've tried Mater nappies before. When my youngest was hospitalised as a baby almost 2 years ago (see pic above). During our extended stay at the Mater the hospital provided the nappies for us to use. I liked them and had no issues with them. 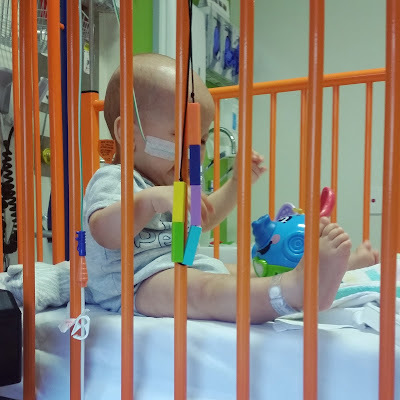 When we went home though, we also went home with a bunch of medical equipment and a baby with a NG tube - both things we needed training on before we were discharged. We went back to our usual nappy brand we had lying around as it was easier and life continued on. Talking to the ladies from Mater during the Bloggers Brunch, I told them a little about my son's story and decided to give the nappies another try now he's bigger. We found that the Mater nappies didn't leak - I think that's the biggest plus right there! During some of the time we were trialling the nappies, my little one was on a course of antibiotics so you can be assured they were tested to the max! Yes! They are not only a product that works for us, I also like that the proceeds from the sale of the Mater Baby Products go to support Mater Little Miracles, funding specialist life-saving care and research for babies in Australia. If you're interested, you can get them online here or find a stockist here. Since I liked the outfit formula above so much, I repeated a similar one again, as I like to do! 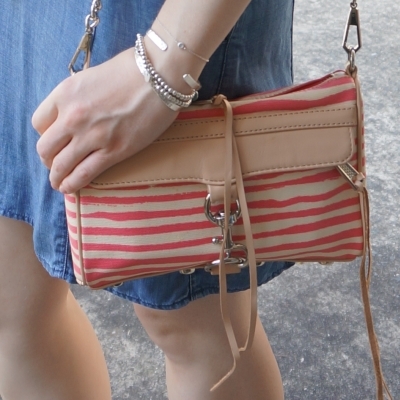 This time, I picked a bright yellow Love quotes scarf to go with the striped navy tee dress, but I kept the bag and ankle boots the same. These ankle boots are the most comfortable I've ever owned, I was sad to see the brand shut up shop a couple of years ago! 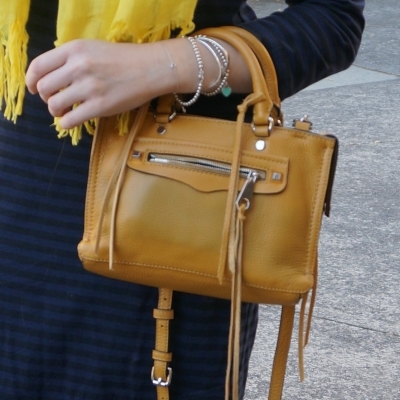 While the linen scarf is a bold bright yellow and the Rebecca Minkoff Regan bag is more mustard, I think the two different shade worked well together in this outfit. Wore this for a fun day out shopping with my mum and the boys. I got some early Christmas present ideas for the boys as we went around the stores. It was such a good day out, even if I didn't buy anything for myself. I'd been eyeing a dress in Jeanswest for an upcoming wedding, but I was a bit disappointed when I saw it in person. 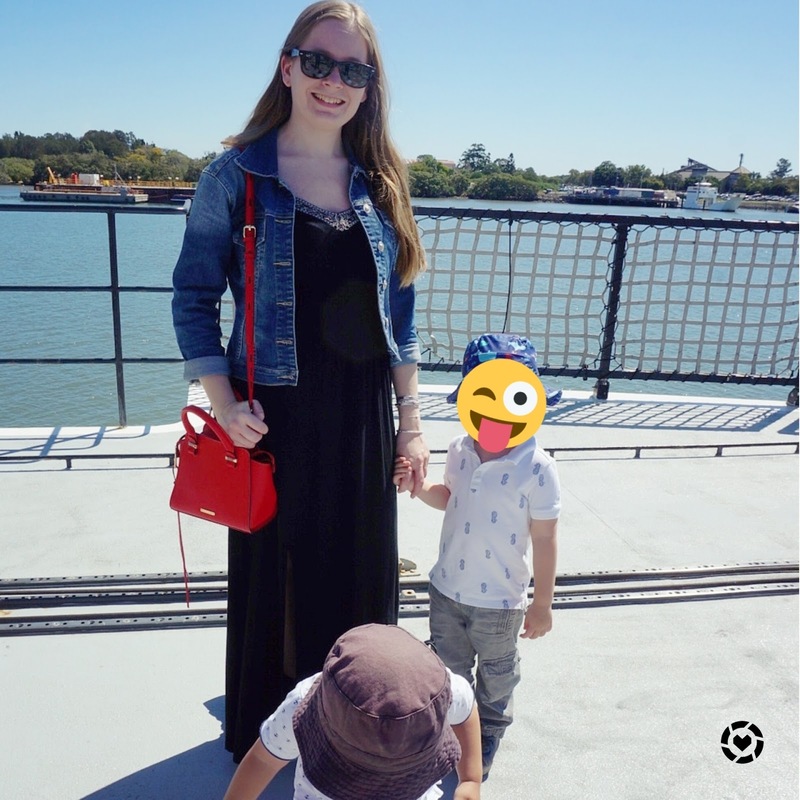 I did like this outfit a little more than the one above - the dress is a more mum-friendly length, with the hem longer in the back! Last worn: yellow Love quotes scarf, navy stripe tee dress, black ankle boots (above), Rebecca Minkoff micro Regan bag (above). Other ways to wear: yellow Love quotes scarf and tie dye maxi dress, navy stripe tee dress in spring, black ankle boots worn 30 ways, Rebecca Minkoff micro Regan bag worn 30 ways. 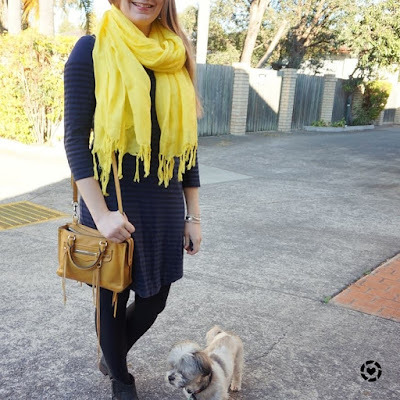 Perfect for pregnancy: yellow Love quotes scarf in second trimester, navy stripe tee dress, black ankle boots in second trimester, Rebecca Minkoff micro Regan bag and maxi skirt. It's easy to stick to neutral outfits in winter, as you're guaranteed all your layers will go together! 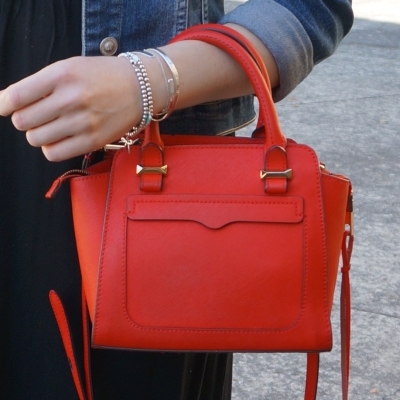 But it's nice to add a touch of colour through bright accessories. 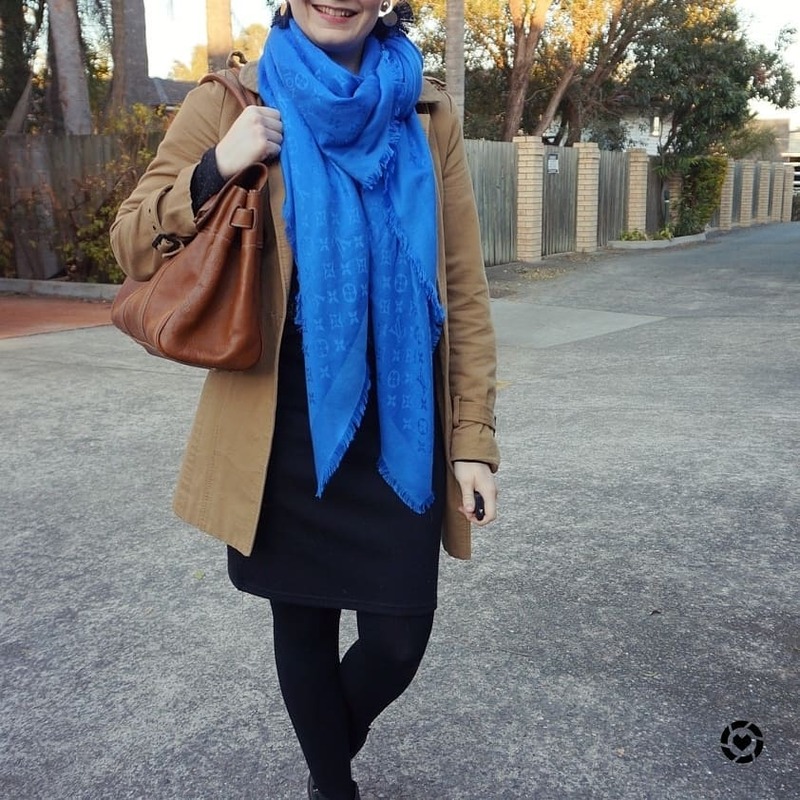 I love my colourful handbags, but a bold and bright scarf is another fun way to accessorise. 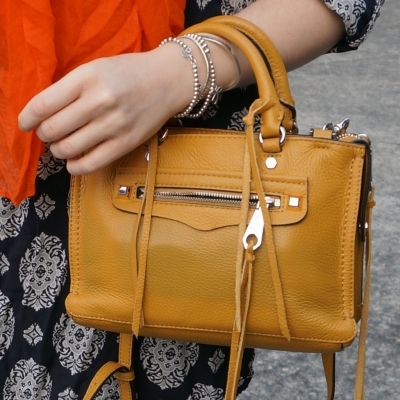 Bright citrus colours like orange and yellow are a great pop against navy outfits. Linking up with Oh Hey Girl, Fashion Files, Fun Fashion, Fabulous Friday, Weekend Wear, Fancy Friday, Friday Faves, Trend Spin. Some items in this post were provided to me for review purposes. As always: all thoughts, opinions and photographs are my own.